Our latest "In Case Of An Accident" brochure has all the great features of the original plus incorporates features from our Accident Camera Kit 1 (AU9970). Gives your customers 8 easy steps to follow when in an accident. 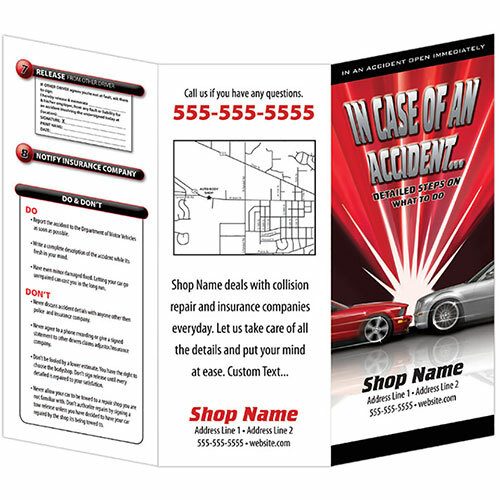 Accidents can be confusing and your customer will appreciate this brochure that aids in their safety and legal protection. 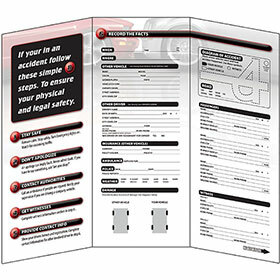 Your information will be imprinted if they have any questions or need any services. One of the best ways to be there for your customer when they need you the most. Extra charges will apply for additional graphics work or map. Size: 3-3/4" x 8-1/2" folded.